Universal Pictures , a subsidiary of NBCUniversal, is one of the six major movie studios. Founded in 1912 by Carl Laemmle, it is one of the oldest American movie studios still in continuous production. On May 11, 2004, the controlling stake in the company was sold by Vivendi Universal to General Electric, parent of NBC. The resulting media super-conglomerate was renamed NBC Universal, while Universal Studios Inc. remained the name of the production subsidiary. In addition to owning a sizable film library spanning the earliest decades of cinema to more contemporary works, it also owns a sizable collection of TV shows through its subsidiary NBCUniversal Television Distribution. It also acquired rights to several prominent filmmakers' works originally released by other studios through its subsidiaries over the years. Its production studios are at 100 Universal City Plaza Drive in Universal City, California. Distribution and other corporate offices are in New York City. Universal Pictures is the second-longest-lived Hollywood studio; Viacom-owned Paramount Pictures is the oldest by a month. Universal Studios is a member of the Motion Picture Association of America . Universal was founded by Carl Laemmle, a German-Jewish immigrant from Laupheim who settled in Oshkosh, Wisconsin, where he managed a clothing store. On a buying trip in 1905 to Chicago, he was struck by the popularity of nickelodeons. One story has Laemmle watching a box office for hours, counting patrons and calculating the day's take. Within weeks of his Chicago trip, Laemmle gave up dry goods to buy the first of several nickelodeons. For Laemmle and other such entrepreneurs, the creation in 1908 of the Edison-backed Motion Picture Trust meant that exhibitors were expected to pay fees for Trust-produced films they showed. Based on Edison's patent for the electric motor used in cameras and projectors, along with other patents, the Trust collected fees on all aspects of movie production and exhibition, and attempted to enforce a monopoly on distribution. It was believed that the productions were meant to be used for another company but the firm turned Universal down. Soon Laemmle and other disgruntled nickelodeon owners decided to avoid paying Edison by producing their own pictures. In June 1911, Laemmle started the Yankee Film Company with partners Abe and Julius Stern. That company quickly evolved into the Independent Moving Pictures Company . Laemmle broke with Edison's custom of refusing to give billing and screen credits to performers. By naming the movie stars, he attracted many of the leading players of the time, contributing to the creation of the star system. In 1910, he promoted Florence Lawrence, formerly known as "The Biograph Girl," and actor King Baggot, in what may be the first instance of a studio using stars in its marketing. The Universal Film Manufacturing Company was incorporated April 30, 1912 in New York. Laemmle, who emerged as president in July 1912, was the primary figure in a partnership that included Mark Dintenfass, Charles Baumann, Adam Kessel, and Pat Powers. Eventually all would be bought out by Laemmle. Baumann and Kessel later partnered with Mack Sennett for their highly successful Keystone Film Company. The new Universal studio was a horizontally integrated company, with movie production and distribution capacity . The company was incorporated as Universal Pictures Company, Inc. in 1925. Following the westward trend of the industry, by the end of 1912 the company was focusing its production efforts in the Hollywood area. Its first logo was an Earth with a Saturn-like ring and the text in a bold Kentucky font. In 1963, this logo was revamped with mattes and animated models. In 1990, it was replaced by a filmed 3D model, leading ultimately to today's logo which uses CGI animation. In 1915, Laemmle opened the world's largest motion picture production facility, Universal City Studios, on a 230-acre (0.9-km²) converted farm just over the Cahuenga Pass from Hollywood. 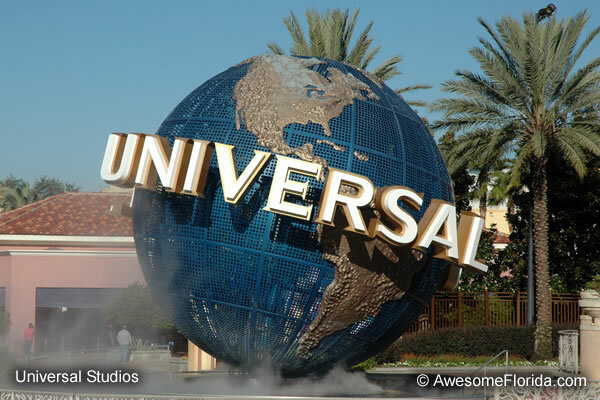 Studio management became the third facet of Universal's operations, with the studio incorporated as a distinct subsidiary organization. Unlike other movie moguls, Laemmle opened his studio to tourists. Universal became the biggest studio in Hollywood, and remained so for a decade. However, it sought an audience mostly in small towns, producing mostly inexpensive melodramas, westerns and serials. Despite Laemmle's role as an innovator, he was an extremely cautious studio chief. Unlike rivals Adolph Zukor, William Fox, and Marcus Loew, Laemmle chose not to develop a theater chain. He also financed all of his own films, refusing to take on debt. This policy nearly bankrupted the studio when actor-director Erich von Stroheim insisted on excessively lavish production values for his films Foolish Wives and Blind Husbands, but Universal shrewdly got some of its money back by launching a sensational ad campaign that attracted moviegoers. Character actor Lon Chaney became a huge drawing card for Universal in the 1920s, appearing steadily in dramas. His two biggest hits for Universal were The Hunchback of Notre Dame and The Phantom of the Opera . During this period Laemmle entrusted most of the production policy decisions to Irving Thalberg. Thalberg had been Laemmle's personal secretary, and Laemmle was impressed by Thalberg's cogent observations of how efficiently the studio could be operated. Promoted to studio chief, Thalberg was giving Universal's product a touch of class, something it seldom had during the silent era. Contentious business dealings involving Universal over the drawing of a cartoon character may have affected the course of animation history. Although Walt Disney and Ub Iwerks had created the "Oswald the Lucky Rabbit" character, which had enjoyed a successful theatrical run, Universal – and not Disney – owned the rights to it. This gave Mintz leverage in demanding that Disney accept a lower fee for producing the property or he would produce the films with his own group of animators. In the end, Disney refused the offer. As an alternative, he and Iwerks created what became Disney's flagship trademark, Mickey Mouse, which contained some of Oswald's features and soared to popularity following the duo's producing of its first talking short, Steamboat Willie. This moment effectively launched Walt Disney Studios' foothold, while Universal became a minor player in film animation after Oswald. Universal cut its ties with Mintz and formed its own in-house animation studio to produce Oswald cartoons headed by Walter Lantz. In 2006, after almost 80 years, NBC Universal sold all Walt Disney-produced Oswald cartoons back to Disney. In return, Disney released ABC sportscaster Al Michaels from his contract so he could work on NBC's Sunday night NFL football package. However, Universal kept the Oswald cartoons that Walter Lantz produced for them from 1929 to the mid-1930s. In 1928, Laemmle, Sr. made his son, Carl, Jr. head of Universal Pictures as a 21st birthday present. Universal already had a reputation for nepotism—at one time, 70 of Carl, Sr.'s relatives were supposedly on the payroll. Many of them were nephews, resulting in Carl, Sr. being known around the studios as "Uncle Carl." Ogden Nash famously quipped in rhyme, "Uncle Carl Laemmle/Has a very large faemmle." Among these relatives was future Academy Award winning director/producer William Wyler. To his credit, "Junior" Laemmle persuaded his father to bring Universal up to date. He bought and built theaters, converted the studio to sound production, and made several forays into high-quality production. His early efforts included the 1929 part-talkie version of Edna Ferber's novel Show Boat, the lavish musical Broadway which included Technicolor sequences; the first all-color musical feature , King of Jazz ; and All Quiet on the Western Front, winner of the "Best Picture" Academy Award for 1930. Laemmle, Jr. also created a successful niche for the studio, beginning a long-running series of monster movies, affectionately dubbed Universal Horror, among them Frankenstein, Dracula, The Mummy and The Invisible Man. The 1931 six-sheet (81-by-81-inch) poster for Frankenstein is considered to be the most valuable movie poster in the world. There is only one copy of this poster known to exist. Other Laemmle productions of this period include Imitation of Life and My Man Godfrey. The end for the Laemmles came with a lavish remake of its 1929 flop Show Boat, featuring several stars from the Broadway stage version, which began production in late 1935. Eventually, Carl, Jr.'s spending habits alarmed company stockholders. They would not allow production to start on Show Boat unless the Laemmles obtained a loan. Universal was forced to seek a $750,000 production loan from the Standard Capital Corporation, pledging the Laemmle family's controlling interest in Universal as collateral. It was the first time Universal had borrowed money for a production in its 26-year history. Production problems resulted in a $300,000 overrun. When Standard called the loan in, a cash-strapped Universal couldn't pay. Standard foreclosed and seized control of the studio on April 2, 1936. Universal's 1936 Show Boat, released a little over a month after Standard seized control, was a great success financially and is widely considered to be one of the greatest film musicals of all time. However, it was not enough to save the Laemmles, who were unceremoniously removed from the company they had founded. Despite the takeover, Show Boat was released with Carl Laemmle and Carl Laemmle Jr.'s names on the credits and the advertising campaign for the film. Standard Capital's J. Cheever Cowdin took over as president and chairman of the board of directors, and instituted severe cuts in production budgets. Gone were the big ambitions, and though Universal had few big names under contract, those it had been cultivating, like William Wyler and Margaret Sullavan, now left. By the start of World War II, the company was concentrating on smaller-budget productions that had been the company's main staples: westerns, melodramas, serials and sequels to the studio's horror pictures. Producer Joe Pasternak, who had been successfully producing light musicals with young sopranos for Universal's German subsidiary, came to America and repeated his tried-and-true formula. Sensational teenage songbird Deanna Durbin starred in Pasternak's first American film, Three Smart Girls . The film was a box-office success and restored the studio's solvency. The success of the film led Universal to offer her a contract, which for the first five years of her career produced her most successful pictures. As Pasternak stopped producing her pictures, and Durbin outgrew her screen persona and pursued more dramatic roles, the studio signed 13-year-old Gloria Jean for her own series of Pasternak musicals; she went on to star with Bing Crosby, W. C. Fields, and Donald O'Connor. Another hit Universal film of the late 1930s was 1939's Destry Rides Again, starring James Stewart as Destry and Marlene Dietrich in her comeback role after leaving Paramount Studios. Universal could seldom afford its own stable of stars, and often borrowed talent from other studios, or hired freelance actors. In addition to Stewart and Dietrich, Margaret Sullavan, and Bing Crosby were some of the major names that made a couple of pictures for Universal during this period. Some stars came from radio, including W. C. Fields, Edgar Bergen, and the comedy team of Abbott and Costello . Abbott and Costello's military comedy Buck Privates catapulted the former burlesque comedians to worldwide success. Abbott and Costello soon became the biggest movie stars in America, surpassing Durbin's films in popularity and box office success. During the war years Universal did have a co-production arrangement with producer Walter Wanger and his partner, director Fritz Lang, lending the studio some amount of prestige productions. Universal's customer base was still the neighborhood movie theaters, and the studio continued to please the public with low- to medium-budget comedies, musicals, adventures, westerns, and serials. The studio also fostered many series: The Dead End Kids and Little Tough Guys action features and serials (1938–43), the comic adventures of infant Baby Sandy (1938–41), Hugh Herbert comedies (1938–42), horror thrillers with Frankenstein, Dracula, The Wolf Man, The Invisible Man, and The Mummy (1931–45), Basil Rathbone and Nigel Bruce in Sherlock Holmes mysteries (1939–46), teenage musicals with Gloria Jean, Donald O'Connor, and Peggy Ryan (1942–43), and screen adaptations of radio's Inner Sanctum Mysteries (1943–45). As Universal's main product had always been low-budget film, it was one of the last major studios to have a contract with Technicolor. The studio first made use of the new, three-color Technicolor process in 1942, when it released Arabian Nights, starring Jon Hall and Maria Montez. The following year, Technicolor was also used in Universal's remake of their 1925 horror melodrama, Phantom of the Opera with Claude Rains and Nelson Eddy. With the success of their first two pictures, a regular schedule of high-budget, Technicolor films followed, usually starring Montez and Hall. In 1945, the British entrepreneur J. Arthur Rank, hoping to expand his American presence, bought into a four-way merger with Universal, the independent company International Pictures, and producer Kenneth Young. The new combine, United World Pictures, was a failure and was dissolved within one year. Rank and International remained interested in Universal, however, culminating in the studio's reorganization as Universal-International. William Goetz, a founder of International, was made head of production at the renamed Universal-International Pictures Inc., which also served as an import-export subsidiary, and copyright holder for the production arm's films. Goetz, a son-in-law of Louis B. Mayer decided to bring "prestige" to the new company. He stopped the studio's low-budget production of B movies and curtailed Universal's famous "monster" and "Arabian Nights" series. Distribution and copyright control remained under the name of Universal Pictures Company Inc.
Goetz licensed Universal's pre Universal-International film library to Jack Broeder's Realart Pictures for cinema re-release but Realart was not allowed to show the films on television. The production arm of the studio still struggled. While there were to be a few hits like The Egg & I, The Killers, and The Naked City, Universal-International's new theatrical films often met with disappointing response at the box office. By the late 1940s, Goetz was out, and the studio reverted once more to the low-budget fare it knew best. The inexpensive Francis the Talking Mule and Ma and Pa Kettle series became mainstays of the new company. Once again, the films of Abbott and Costello, including Abbott and Costello Meet Frankenstein, were among the studio's top-grossing productions. But at this point Rank lost interest and sold his shares to the investor Milton Rackmil, whose Decca Records would take full control of Universal in 1952. Besides Abbott and Costello, the studio retained the Walter Lantz cartoon studio whose product was released with Universal-International's films. In the 1950s, Universal-International brought back a series of Arabian Nights films, many starring Tony Curtis. The studio also had a success with monster and science fiction films produced by William Alland with many directed by Jack Arnold. Other successes were big budget melodramas produced by Ross Hunter and directed by Douglas Sirk. Among Universal-International's stable of stars were Rock Hudson, Tony Curtis, Jeff Chandler, Audie Murphy and John Gavin. Though Decca would continue to keep picture budgets lean, it was favored by changing circumstances in the film business, as other studios let their contract actors go in the wake of the 1948 U.S. vs. Paramount Pictures, et al. case. Leading actors were increasingly free to work where and when they chose, and in 1950 MCA agent Lew Wasserman made a deal with Universal for his client James Stewart that would change the rules of the business. Wasserman's deal gave Stewart a share in the profits of three pictures in lieu of a large salary. When one of those films, Winchester '73 proved to be a hit, Stewart became a rich man. This arrangement would become the rule for many future productions at Universal, and eventually at other studios as well. By the late 1950s, the motion picture business was in trouble. The combination of the studio/theater-chain break-up and the rise of television saw the mass audience drift away, probably forever. The Music Corporation of America , mainly a talent agency, had also become a powerful television producer, renting space at Republic Studios for its Revue Productions subsidiary. After a period of complete shutdown, a moribund Universal agreed to sell its 360-acre (1.5 km²) studio lot to MCA in 1958, for $11 million, renamed Revue Studios. Although MCA owned the studio lot, but not Universal Pictures, but it was increasingly influential on Universal's product. The studio lot was upgraded and modernized, while MCA clients like Doris Day, Lana Turner, Cary Grant, and director Alfred Hitchcock were signed to Universal Pictures contracts. The long-awaited takeover of Universal Pictures by MCA, Inc. finally took place in mid-1962 as part of MCA -Decca Records merger (Universal's then parent company), with MCA as surviving corporation. Universal-International Pictures, the production subsidiary reverted in name back to Universal Pictures. As a last gesture before getting out of the talent agency business, virtually every MCA client was signed to a Universal contract. In 1964 MCA formed Universal City Studios, Inc. to take over the motion pictures and television arms of Universal Pictures Company and Revue Productions . And so, with MCA in charge, for a few years in the 1960s Universal became what it had never been: a full-blown, first-class movie studio, with leading actors and directors under contract; offering slick, commercial films; and a studio tour subsidiary . But it was too late, since the audience was no longer there, and by 1968, the film-production unit began to downsize. Television carried the load, as Universal dominated the American networks, particularly NBC , where for several seasons it provided up to half of all prime time shows. An innovation of which Universal was especially proud was the creation in this period of the made-for-television movie. Though Universal's film unit did produce occasional hits, among them Airport, The Sting, American Graffiti, Earthquake, and a blockbuster that restored the company's fortunes, Jaws, Universal in the 1970s was primarily a television studio. Weekly series production was the workhorse of the company. There would be other film hits like E.T. the Extra-Terrestrial, Back to the Future, and Jurassic Park, but the film business was still hit-and-miss. In the early 1950s, Universal set up its own distribution company in France, and in the late 1960s, the company also started a production company in Paris, Universal Productions France S.A., although sometimes credited by the name of the distribution company, Universal Pictures France. Except for the two first films it produced, Claude Chabrol's Le scandale and Romain Gary's Les oiseaux vont mourir au Pérou , it was only involved in French or other European co-productions, the most noticeable ones being Louis Malle's Lacombe, Lucien, Bertrand Blier's Les Valseuses , and Fred Zinnemann's The Day of the Jackal. It was only involved in some 20 film productions before being dismantled in the mid 1970s. In the early 1970s, Universal teamed up with Paramount Pictures to form Cinema International Corporation, which distributed films by Paramount and Universal worldwide. It was replaced by United International Pictures in 1981, when Metro-Goldwyn-Mayer joined the fold. UIP began distributing films by start-up studio DreamWorks in 1997, and MGM subsequently dropped out of the venture in 2001, letting 20th Century Fox internationally distribute its films. In 1990, MCA created MCA/Universal Home Video Inc. to enter the lucrative videotape and later DVD sales industry. Anxious to expand the company's broadcast and cable presence, longtime MCA head Lew Wasserman sought a rich partner. He located Matsushita Electric , the Japanese electronics manufacturer, which agreed to acquire MCA for $6.6 billion in 1990. Around this time, the production subsidiary was renamed Universal Studios Inc. Matsushita provided a cash infusion, but the clash of cultures was too great to overcome, and five years later Matsushita sold an 80% stake in MCA/Universal to Canadian liquor distributor Seagram for $5.7 billion. Seagram sold off its stake in DuPont to fund this expansion into the entertainment industry. Hoping to build an entertainment empire around Universal, Seagram bought PolyGram in 1999 and other entertainment properties, but the fluctuating profits characteristic of Hollywood were no substitute for the reliable income stream gained from the previously held shares in DuPont. To raise money, Seagram head Edgar Bronfman Jr. sold Universal's television holdings, including cable network USA, to Barry Diller. In June 2000, Seagram was sold to French water utility and media company Vivendi . The media conglomerate became Vivendi Universal. Afterward, Universal Pictures acquired the United States distribution rights of several of StudioCanal's films, such as Mulholland Drive and Brotherhood of the Wolf (which became the second-highest-grossing French-language film in the United States in the last two decades). Universal Pictures and StudioCanal also co-produced several films, such as Love Actually (an $40 million-budgeted film that eventually grossed $246 million worldwide). Burdened with debt, in 2004 Vivendi Universal sold 80% of Vivendi Universal Entertainment to General Electric, parent of NBC. The resulting media super-conglomerate was renamed NBC Universal, while Universal Studios Inc. remained the name of the production subsidiary. Though some expressed doubts that regimented, profit-minded GE and high-living Hollywood could coexist, as of 2007 the combination has worked. The reorganized "Universal" film conglomerate has enjoyed several financially successful years. After that deal, GE owned 80% of NBC Universal; Vivendi held the remaining 20%, with an option to sell its share in 2006. GE purchased Vivendi's share in NBCU in 2010 and in turn sold 51% of the company to cable provider Comcast. Comcast merged the former GE subsidiary with its own cable-television programming assets, creating the current NBCUniversal. Following FCC approval, the Comcast-GE deal was closed on Jan. 29, 2011. In late 2005, Viacom's Paramount Pictures acquired DreamWorks SKG after acquisition talks between GE and DreamWorks stalled. Universal's long time chairperson, Stacey Snider, left the company in early 2006 to head up DreamWorks. Snider was replaced by then-Vice Chairman Marc Shmuger and Focus Features head David Linde. On October 5, 2009 Marc Shmuger and David Linde were ousted and their co-chairperson jobs consolidated under former president of worldwide marketing and distribution Adam Fogelson becoming the single chairperson. Donna Langley was also upped to co-chairperson. Over the years, Universal has made deals to distribute and/or co-finance films with various small companies, such as Imagine Entertainment, Media Rights Capital, Amblin Entertainment, Morgan Creek Productions, Spyglass Entertainment, Working Title Films , StudioCanal, Relativity Media, Strike Entertainment, Shady Acres Entertainment, Mandalay Entertainment, Marc Platt Productions, Illumination Entertainment and Beacon Communications LLC. Whole or part of the information contained in this card come from the Wikipedia article "Universal Studios", licensed under CC-BY-SA full list of contributors here.